Japan's Nikkei 225 stock average dropped 234.83 points, or 2.7 percent, to 8,488.95, after being closed Tuesday for a holiday. HONG KONG — Asian stocks stumbled Wednesday after downbeat data about the U.S. economy showed the recession there was deepening. Japan's Nikkei 225 stock average dropped 198.68 points, or 2.3 percent, to 8,525.10, after being closed Tuesday for a holiday. Shares in Toyota Motor Corp. tumbled 4 percent in their first trading day since Monday, when the world's largest automaker said it expected to post its first operating loss in almost 70 years. Automakers across the region were hit with heavy selling as well. Hong Kong's Hang Seng Index closed down 0.3 percent to 14,184.14, while South Korea's Kospi lost -1.3 percent to 1,129.14. "The end-of-the-year, bear-market, feel-good rally is ending sooner than many expected," said Kirby Daley, senior strategist at Newedge Group in Hong Kong. "Investors are being hit in the face with the reality of just how bad the U.S. economy is and they're seeing firsthand the effects this is having on the consumer and, as a result, companies like Toyota and U.S retailers." Elsewhere, Shanghai's benchmark lost over 1 percent, while key indices in Australia, Taiwan and Singapore gained. Trading was feather-light throughout Asia, and some markets closed early for the holiday. Many investors found little reason to buy after reports released overnight in the U.S. showed no signs of a turnaround in the world's largest economy, already in recession. The government said third-quarter gross domestic product fell at an annual rate of 0.5 percent. The hard-hit housing sector also continued to deteriorate. New home sales weakened last month to the slowest pace in nearly 18 years, and prices of new homes dropped by the biggest amount in eight months. The sobering news sent Wall Street lower, with the Dow Jones industrial average shedding 100.28 points, or 1.18 percent, to 8,419.49. The Standard & Poor's 500 index fell 8.47 points, or 0.97 percent, to 863.16. Wall Street futures pointed to a flat opening on Wednesday, when U.S. markets will close early for the Christmas holiday. Worries that demand would sink further well into 2009 pulled car companies lower. Honda Motor Co., Japan's No. 2 automaker, plummeted 5.9 percent, while South Korea's Hyundai Motor Co. shed 3.4 percent. Oil prices were steady, up 16 cents at $39.14 a barrel in Asian trade on the New York Mercantile Exchange. The February contract fell 93 cents to settle at $38.98. In currencies, the dollar sank to 90.31 yen, down from 90.85 yen. The euro traded higher at $1.3966 from $1.3932. Many markets across Asia will be closed Thursday for Christmas, including Hong Kong, Singapore and Australia. 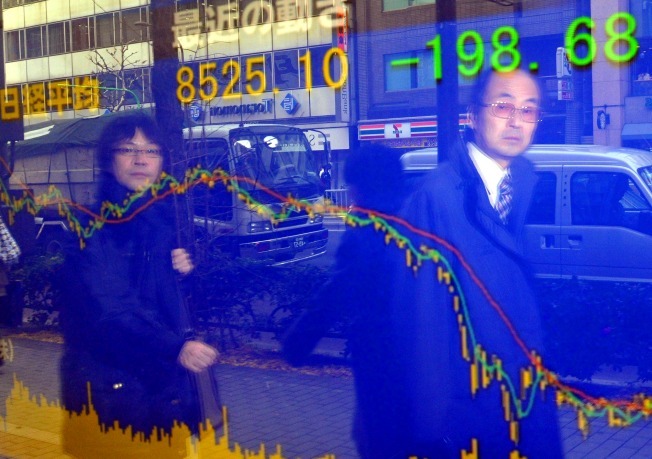 Japan's stock market, however, will be open.